Smaller parties face political extinction with polls showing Kulanu, Hatnuah, and Gesher failing to enter the Knesset. The Likud remains the clear favorite to win the upcoming Knesset election, slated for April 9th, a new poll shows, though a newly-established party headed by a former army chief continues to gain support and cut into the Likud’s lead. According to the new poll, conducted by Direct Polls and published by Makor Rishon on Friday, shows former IDF Chief of Staff Benny Gantz’s new Israel Resilience Party continuing to gain support, rising from a projected 22 seats in a poll released on February 6th to 23 seats. On January 24th, Direct Polls projected the party would win just 15 seats. Gantz launched the party last year, and made his debut speech at the end of January. Since then, a merger with former Defense Minister Moshe Yaalon’s Telem faction has seen the joint list pass the 20-mandate mark in nearly every subsequent poll. Nevertheless, incumbent Prime Minister Binyamin Netanyahu’s Likud retains a nine-mandate lead, the poll shows, with 32 seats – a gain of two mandates over its current 30 seats. The Likud continues to poll well, despite police recommendations to indict Netanyahu in connection with three separate corruption investigations. The continuing strong support for the Likud in the polls comes at part at the expense of smaller right-wing and center-right parties, many of which are at danger of failing to clear the 3.25% electoral threshold, leaving them out of the 21st Knesset. 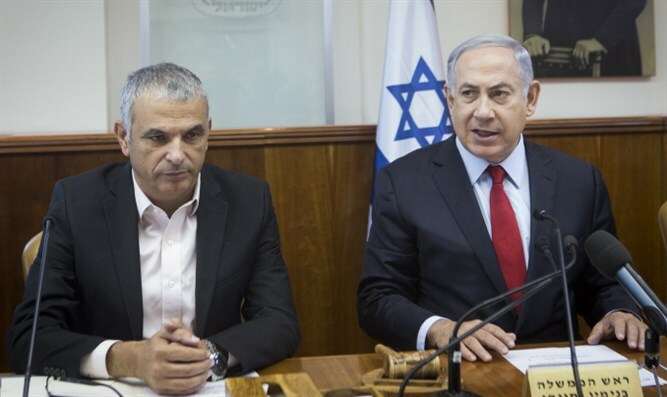 Finance Minister Moshe Kahlon’s Kulanu, for instance, now fails to cross the threshold, the poll shows, despite having won 10 seats in 2015. Another poll released Friday also showed Kulanu below the threshold. These are the first two polls to show the party beneath the threshold since 2015. Gesher, the newly-formed party of ex-Yisrael Beytenu MK Orly Levy, also fails to cross the threshold in the latest poll. While Gesher initially surprised observers with polls suggesting it could win as many as eight seats, enthusiasm for the party has fallen as other new factions, including Israel Resilience and the New Right were launched. This is the third poll this week which shows Gesher, which had averaged five seats in polls in January, failing to cross the threshold. In addition, Tzipi Livni’s Hatnuah, which won six seats in a joint list with Labor in 2015, would not clear the threshold, the new poll shows. Several small right-wing parties, none of which are currently represented in the Knesset, also fail to cross the threshold. Otzma Yehudit, led by former Kach activists Baruch Marzel and Michael Ben-Ari; former Interior Minister Eli Yishai’s Yahad; and the libertarian-leaning Zehut all fail to pass the threshold, according to the new poll. The Jewish Home and National Union would, if they ran on a joint list, win four seats, while Yisrael Beytenu would net five mandates. The New Right, led by Naftali Bennett, would win eight seats. Among the haredi factions, Shas would lose a mandate, falling from seven to six, while United Torah Judaism would gain a seat, rising from six to seven. Yesh Atid would remain steady with 11 mandates, while the Labor party would plummet from 18 to just 7 seats. The far-left Meretz party would remain steady at five seats, while the two Arab parties would win a combined 12 mandates.